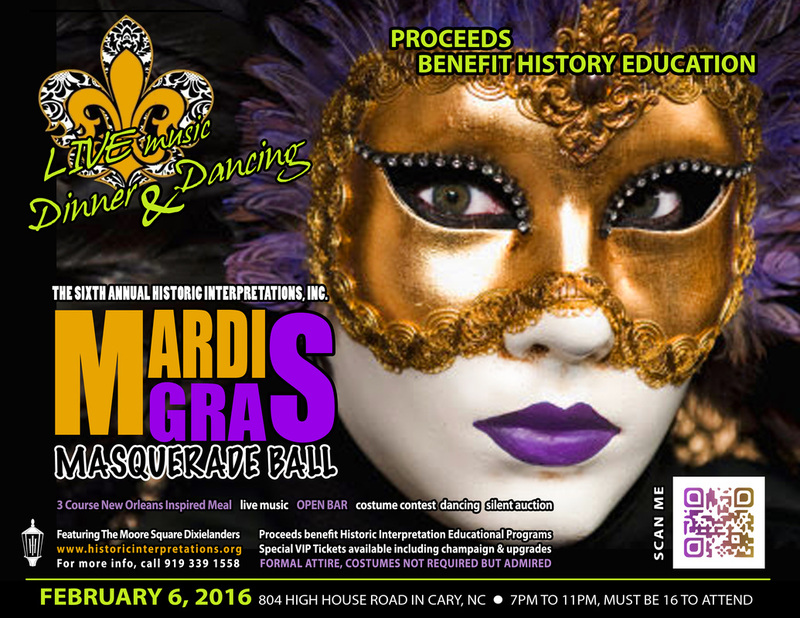 Mardi Gras Ball - Historic Interpretations, Inc.
﻿Historic Interpretations, Inc. is pleased to announce our annual Mardi Gras Ball Masquerade Ball Fundraiser. Admission includes a sumptuous three-course meal✩ inspired by traditional New Orleans recipes and unlimited drinks - including soda, wine and beer*. During dinner enjoy live music, including old favorites and Mardi Gras jazz provided by the Moore Square Dixielanders, and stick around to hit the dance floor for dance hits. Event photography, door prizes, a costume contest, raffles and a silent auction✧ will round out the evening's festivities. Unfortunately the dance demonstration by the Arthur Murray Dance Studios of Cary has been cancelled. But they are donating to our silent auction. THANK YOU! Your general admission ticket for all this is only $40.00. VIP packages and tables are available. On Sale until 2.4.16 by midnight. This is our annual fundraiser, and ALL proceeds benefit the educational programs of Historic Interpretations, Inc., a North Carolina non-profit dedicated to education through first-person interpretation of historic characters. We request semi-formal or costume attire. *You must 16 to attend, and 21 (w/ID) to consume alcoholic beverages. ✩ Vegetarian meals are available upon request when purchasing tickets. ✧ Credit cards and cash accepted for silent action and raffle purposes. Event partners... VIVO Masks from Italy! Looking for the perfect mask? Check out VIVO Masks! This year we have partnered with VIVO Masks to offer you beautiful and authentic masquerade masks for men and women. To take advantage of this offer we invite you to use promo code MARDIGRASBALL2016 at checkout for 15% off your order. Plus you could WIN a gold filagree mask (pictured right) at our event on the 6th! Thank you, VIVO Masks! North Carolina is rich with history, and many of it's historical landmarks are underfunded and understaffed. Historic Interpretations, Inc. works with these sites, as well as libraries, museums, and public schools to offer hands-on living history demonstrations and performances that are genuine and based in the REAL lives and histories of North Carolina and the surrounding areas. or e-mail us at info@historicinterpretations.org. Very limited number of tickets available at the door.First come, first serve. Looking for more than just tickets? Make your night all the more merrier with our special VIP Packages, offering gifts and champagne for you and your guests. Your seating at the event will be premium and includes benefits. VIP packages available until midnight on 2.04.16. General Admission $40.00. VIP KREWE CAPTAIN - $100.00 AMAZING DEAL!!! Includes: Two tickets to the event, recognition during the festivities, champagne, PLUS photo booth wristbands (valued at $20.00) and keepsake. Includes: Tickets for four to the event, recognition during the festivities, champagne, PLUS photo booth wristbands (valued at $20.00), raffle tickets (5 per person) and keepsakes. Includes: Private table for eight, recognition during the festivities, and champagne, with photo wristbands, keepsakes, & 10 raffle tickets per person. EST value $700. Includes: Private table for eight, recognition during the festivities, and champagne, and photo booth wristbands, keepsakes and raffle tickets (10 per person). Includes: Private table for eight, commemorative metal crowns for the "king & queen of Mardi Gras", recognition during the festivities, champagne, photo booth wristbands, keepsakes and raffle tickets (20 per person). Only one available. Limited number of individual tickets available at the door.